My paper “Okun’s Law: Fit at Fifty?” (with Larry Ball and Daniel Leigh) has now been published in the October 2017 issue of the Journal of Money, Credit & Banking. For those without access to the journal, here is a link to the penultimate version of the paper, which also provides the data and programs needed to replicate the results of the paper. 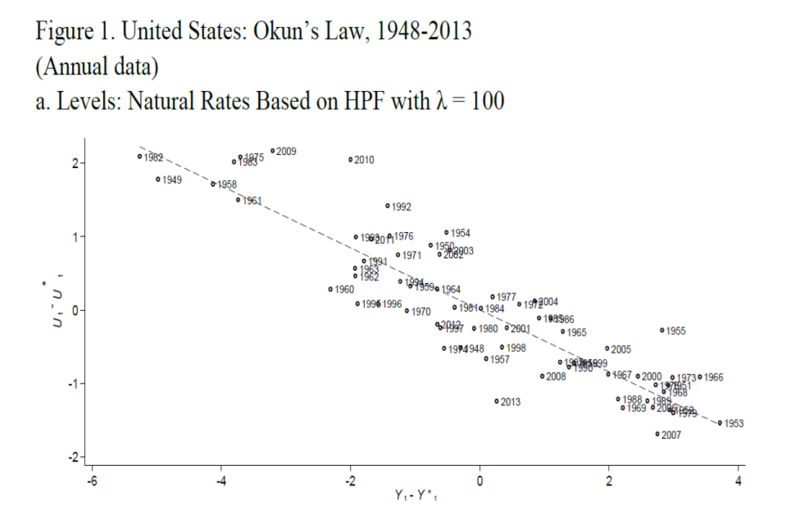 The main result of the paper is that, fifty five years after it was proposed, Okun’s Law remains visible to the naked eye (see the chart below). We find that, for the United States, Okun’s Law is fairly stable and held up during the Great Recession, substantiating predictions that Paul Krugman made in 2011. We also provide evidence for several other advanced economies, such as Spain and Germany.